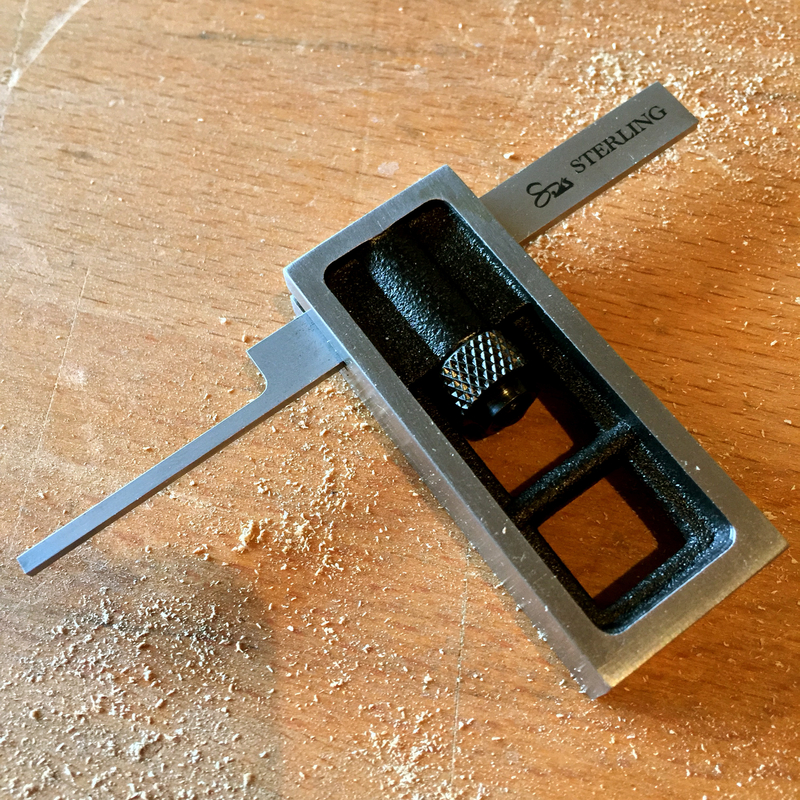 At Handworks two weeks ago, Sterling Tool Works announced their latest tool. The Double Square is a small machinists square perfectly sized to keep in your workshop apron pocket, and comes with a 4″ ruler marked in both imperial and real (metric) numbers, as well as a fine dovetail ruler for reaching into confined spaces. Sadly I wasn’t at Handworks, but I have been fortunate to score the first Double Square to reach English shores. After nearly a week of using the Double Square, I am pleased to report that it is an excellent addition to my tool chest. The body of the square feels solid and has a pleasing heft that inspires confidence in the hand, while not being overly heavy for fine work. The locking nut secures the ruler with authority, and I’ve not had any worries about the ruler slipping while in use. Having a compact precision square and ruler always to hand makes it ever so easy to take measurements and check that components are square. 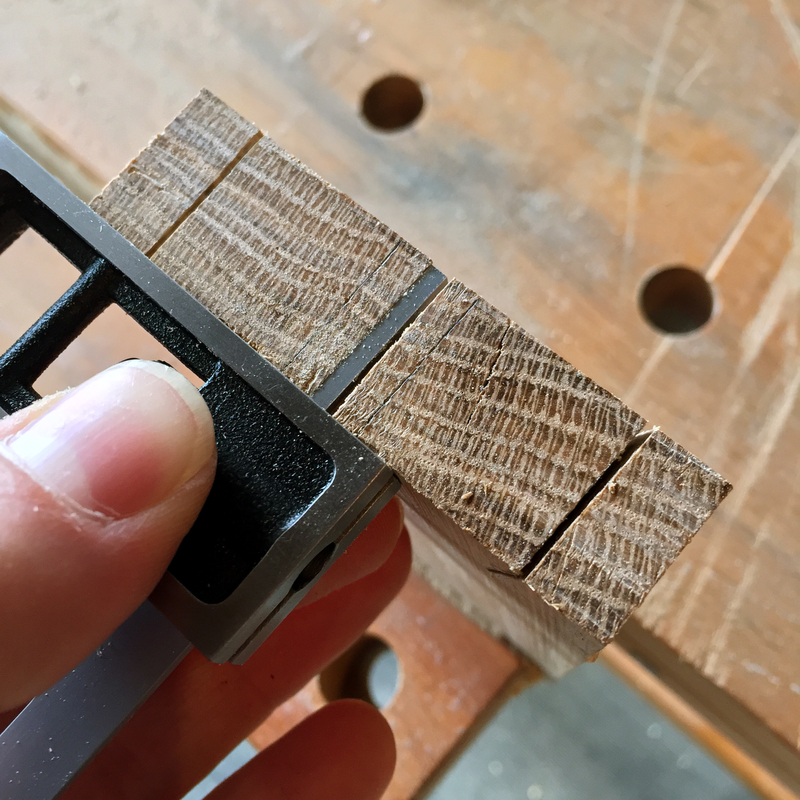 But it is the dovetail blade that is undoubtedly the star of the show, as the relieved end allows you to each into spaces that other squares won’t reach, particularly between dovetails or into narrow mortices. The dovetail ruler is also available separately, and is reported to fit a number of squares by other manufacturers (see the Sterling Tool Works website for more details) so is a worthwhile purchase if you do a lot of dovetailing and already have a Starrett or other brand square. Checking dovetails (although invaluable) is only one of many operations I can see myself using the Double Square for. When fitting bridges to acoustic guitars, I check the curvature of the underside of the bridge by holding a ruler across the curved surface and looking at what light escapes underneath the ruler. The dovetail blade provides a neater and less distracting straight edge to check this essential fit, and I am looking forward to using the Double Square when fitting the bridge to the parlour guitar soon. The Double Square is now living in my apron pocket, where I expect it to stay for a good many years. The finish and attention to detail is what I have come to expect of Sterling Tool Works, and considering that this is only the third tool Sterling have released, I am excited to see what they come up with next. Glad you found the review useful! The Double Square is effectively a convenient way to combine ruler, small machinists square, and dovetail diagnosis tool in one small package. I’ve found mine to be well worth the investment already.